Surat, with a population of 4.6 million (as per 2011), is the 2nd most populous city of Gujarat. The city of Surat has made remarkable progress in terms of infrastructure development such as water supply, drainage, sewerage, solid waste management, roads, urban poor housing etc. However, the City is now geared towards putting in place improved Public Transport Infrastructure and Integrated Multi-Modal Public Transport System. The existing city transport system is predominantly road based; consisting of informal intermediate para transit, city bus services, private vehicles and recently introduced BRTS Services. The rate of motorization in Surat is one of the highest in the country. The number of vehicles registered in Surat RTO area has risen from four lakh in 1994 to 13 lakh in 2007 to 17 lakh in 2011 and has crossed 24 lakh as recorded in the year March 2015. In 2006, the responsibility of providing/managing public transport was transferred from the state government to the local body. Taking long term sustainability perspective, the city decided to provide primacy to public transport and pedestrians and prepared a comprehensive mobility plan for urban mobility in 2007. 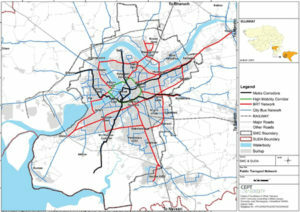 The goal of the Surat Comprehensive Mobility Plan is to provide ‘Integrated land use and transportation system, that minimizes the need for travel, provides choices for modes that are safe, socially, economically, financially and environmentally sustainable and provide a global image for the city’. Efforts towards bridging gaps in infrastructure are being worked out by the city authorities. In line with the City mobility Plan – 2007-08, SMC initiated a phase wise development of the BRTS, named Sitilink from 2008. Today city has 81km operational Sitilink BRTS and a complimentary Sitilink City Bus Service along14 routes, which was introduced to complement the BRT network. In total the urban bus service planned for the city consists of 102km of BRTS and 515km of bus service. The city is looking forward to developing a high mobility corridor along the periphery of the old city and is assessing the feasibility of a Metro rail service. Unlike many cities, Surat has an opportunity for providing an integrated multi-modal transit network. Surat has a high transit demand. 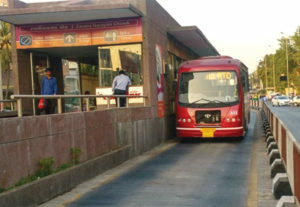 Considering this potential for transit market, the City focused on an extensive BRTS network of 102kms (currently 81 km in operation and 21km under implementation). There are 184 planned stations out of which 128 are operational. Today a fleet of 66 Premium standard AC buses and 50 AC midi buses serve the system. Surat is the first city to run AC-Midi bus instead of the standard bus. Our cities are designed for community living and collective mobility. Recognising this, the city of Surat is developing a multi-modal integrated transit system. Physical integration of various modes and single ticketing system featuring cohesive tariff rates across different service types and modes are key features of the system. To provide a last mile service, Surat has introduced integrated city bus system planned for a 515km network, covering 94% urbanized area, 690 stops locations, served by 50 routes and 875 buses. The city has chosen buses which are suitable for BRTS stations as well as for City Bus Stations thus allowing opportunity for physical integration of the two different services. This is also supported with 12 planned terminals and depots. The design and number of buses required are planned considering the current market size and targeted ridership. Currently 200 buses has been procured and 375 buses are in different stages of procurement.